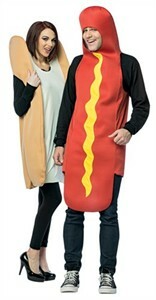 The Hot Dog and Bun Costume is the perfect couples costume! For any dynamic duo that could go for a good hot dog, this is a great costume package for you. With this hot dog and bun costume, you've never fit together so well. Show up to the party with your partner looking like a deliciously cute couple. This hot dog costume package includes two tunic costumes: one bun and one hotdog. Availability: The Adult Hot Dog and Bun Costume Package ships in approximately 1 business day.